The MCM system is a post-trade compliance monitoring client/server application that provides fund and investment managers with an integrated solution that monitors the daily compliance of their investment mandates. The automated compliance monitoring process flags investment guidelines and authorised investment limits for three categories: Breaches, Warnings and Errors. MCM comes with numerous pre-installed investment guidelines covering most major asset classes. For debt securities, MCM provides a large range of solutions to monitor issuer specific authorised investment limits applicable to Annuity, Cash, CPI, Credit Rating, Fixed Interest and Treasury Limits. For more detailed information simply click a button on the right or visit MCM online. The day-to-day compliance monitoring process is initiated via the Data Import Console that starts a new compliance monitoring process by importing and translating the external data. This is automatically followed by the data consolidation process that consolidates the imported and translated data. The process includes financial calculations and stress testing and is completed by the compliance monitoring process. For sample compliance monitoring reports, view the MCM online chapter Reports or click here. MCM provides easy access to all menu items including reports. Each section comprises a number of options that can be restricted to authorised personnel. MCM allows setting up the basic requirements – monitored investment guidelines – and it can also serve as the up-to-date electronic source document. 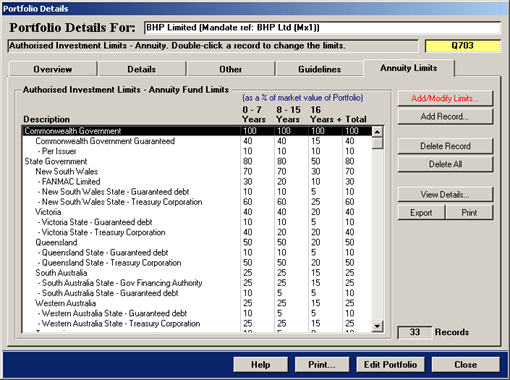 The system can capture the content of industry standard investment mandates and re-print same in similar layout. 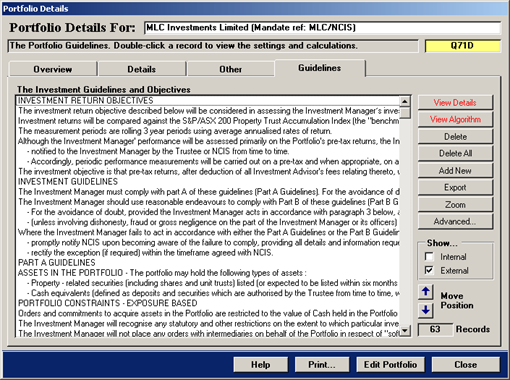 Allocate new guidelines to portfolios by simply selecting from a library of more than 100 unique guidelines and several hundreds of issuers and issuer categories. MCM allows for unlimited combinations to monitor broad categories and sub-categories as well as issuers and issuer specified debt instruments. In addition MCM provides a unique capability to create any combination of credit rating bands. Based on custodian trading data MCM also generates portfolio cash-flow projections that flag a breach if the daily closing balance is negative. Investment guideline breaches that are reported by MCM can be investigated and flagged as a false breach if so determined by the user. All underlying data is available for analysis and exporting to MS Excel. Audit trails provide an overview of how many times each breach was flagged and when. For breaches that are due to incorrect underlying data MCM provides options to resolve same and re-run required processes. The market data retrieval & file generation is performed by the MCM | IRESS Utility that interfaces to the IRESS Market Technology application via API. In addition to automated processes MCM also includes the External Data Import Wizard that is designed to provide a step-by-step procedure in setting up file specifications for external data files. 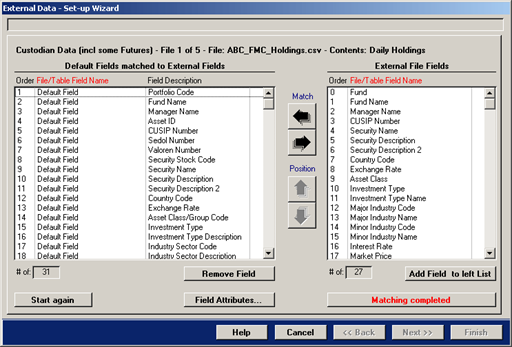 External data files can contain custodian data, futures brokers data and equity indices and security information data. As part of the external file setup MCM includes a Translation Setup & Settings interface that allows the translation of external codes to MCM propriety coding conventions. The interface can handle even the most challenging coding conventions used by external data providers.